Dexterous is a Westpac Business of Tomorrow Winner for helping Companies through their software journey. From Planning, Execution and Configuration. Dexterous provides a best in class inventory management solution for organisations to manage purchases, sales and stock on hand. Directly integrated into your website or Point of Sale! The Dexterous Inventory solution allows for multi-currency transactions and is multi-lingual..
Dexterous is the one piece of software that you need to run your entire business. Dexterous PRO comes standard with all the features you need to assist with Sales, Operations & Communication. The Dexterous Platform is an ever-expanding tool that grows and develops as your business does. With Dexterous you have full control of functionality and design. Unlock the true potential of current software or frameworks being used, increase inefficiencies, save time and grow your business. With Dexterous you have all the information you require at your finger tips. Unlimited reports, graphs, CSV, whatever you require it is there! Transactions Handled By Dexterous Last Month! Dexterous has been recognised by Momentum Energy & 3AW as a winner of it's Small Business Award. You can hear the entire radio interview with Denis Walter as he talks with the Co-Founders of Dexterous, Robert Nisi & Mark Abbott. Everything you need in one solution! 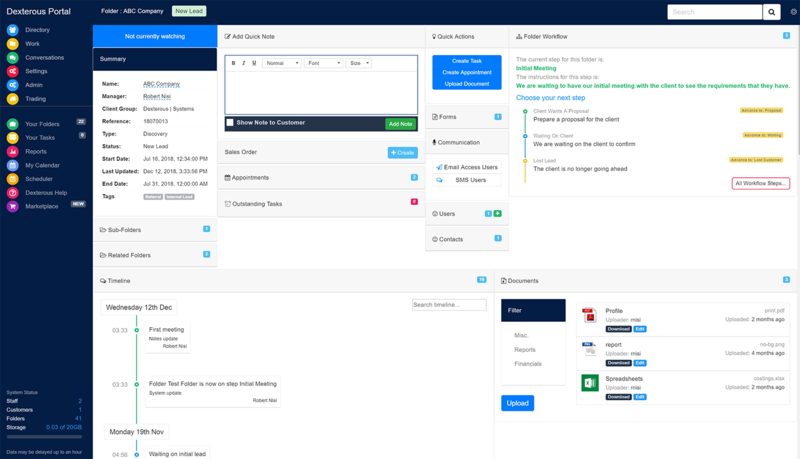 Manage your sales, operations & communication all from Dexterous. Dexterous is 100% Australian owned and developed, with all data being stored on Australian servers! Dexterous PRO is not only amazing on a desktop or laptop, but you can also perform all the same functions on the run with our Mobile App. Manage your jobs and clients all directly from your mobile. Create new leads, jobs and contacts in seconds. Step through your automated workflow processes and procedures while you are on the road. Make phone calls or send emails directly to your contacts from within the Dexterous App. No need to add these contacts to your mobile phone contact list! Using our inbuilt scanning technology, you can create sales orders, quotes and invoices instantly on the Dexterous App. As a Dexterous Partner you can deliver real value to your clients, by gaining detailed insights and process improvements.